Flip the dog bed inside out to create a new look. Cozy yet durable berber fabrics. 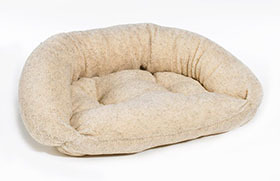 Dogs love the security of the outer bolster while the open front allows easy access and entry for older or arthritic dogs. Great for cooler weather. 33" x 22" x 7"
25" x 16" x 5"
38" x 24" x 7"
30" x 19" x 5"
45" x 27" x 8"
38" x 22" x 6"